Extensive research has been conducted to understand the antecedents and consequences on entrepreneurship, in which institutions were found important factors explaining differences across countries. Similarly, a vast number of scholars have been focused on comprehending those economic consequences of entrepreneurial activity, who highlighted its importance to spur performance and development. 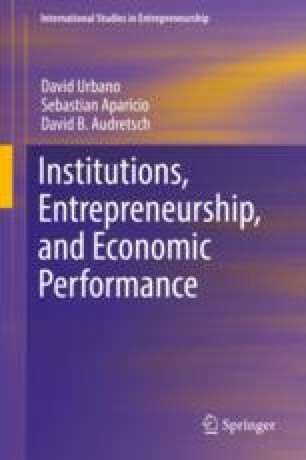 However, scholars have identified that, despite this evidence, part of the story about the relationship between entrepreneurship and economic performance is still incomplete, since the institutional context shapes how these two variables interplay. Therefore, the main objective of this book is to explore the institutional factors that encourage entrepreneurial activity to achieve higher economic performance across developing and developed countries. In this regard, this book places particular emphasis on different types of entrepreneurship and economic performance measures, as well as on specific contexts. In this regard, this introduction offers an overview of the book, including a description and analysis about institutional economics as the theoretical lenses.